These luxury waterfront homes have been specifically designed to offer a striking combination of natural beauty, secluded privacy, and comfort. For those who find city or suburban life draining, each of these properties offers a stunning place to escape and unwind. Every home has a unique character and style, yet all of them offer the same fundamental experience; complete immersion into peaceful country life, yet with a focus on comfort and luxury. Balancing refined taste and rustic realism invariably runs the risk of being unconvincing, occasionally kitsch. Lakes by YOO are a lesson in how it should be done. There is nothing garish, or tacky, or shallow in the design of the homes. 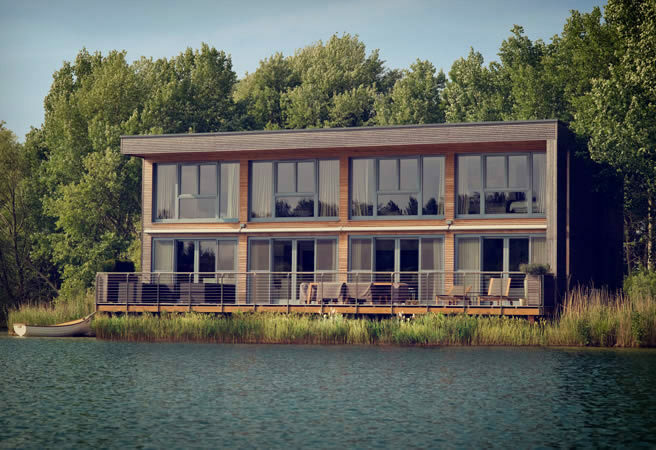 Rather, each rests on a very simple premise; setting the highest quality, tastefully designed properties on the banks of a tranquil lake, surrounded by gorgeous woodland, and letting that speak for itself. The properties are modern country houses in every sense, but their minimalist interiors allow a great deal of freedom when it comes to decorating. There are a range of styles and finishes available, so you can certainly find something to suit your needs. There is also no need to worry about maintaining your home while you are away for the week, month, or year, as a dedicated concierge service and property management team are on-hand to ensure that everything is taken care of. Leaving a home unattended can be one of the most difficult worries to overcome for a prospective second-home owner. Lakes by YOO go to great lengths to ensure that, when you come back to your idyllic retreat, it is exactly as you left it. Homes range from 4 to 6 bedrooms, all with en-suite bathrooms, and all are made to order. Prospective buyers can browse a number of styles to find the one that best suits their taste, and of course anything can be tailored for. If you are searching for your perfect weekend, or even summer, getaway, then there is no easier way to find it than to create it yourself. Lakes by YOO makes this a real possibility. The Lodge is easily the most popular style of home. 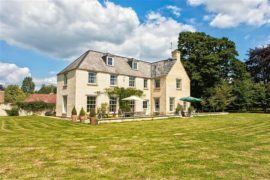 Its open plan layout, large windows and understated aesthetics make this country home a far cry from stuffy rustic cottages that many buyers have in mind when they think of an escape from the city. The Lodge is arguably the most secluded option; nestled snuggly amongst trees at the lakeside, the home clearly offers a great deal of privacy, but the sprawling space inside means that this seclusion is always enjoyable and never suffocating. 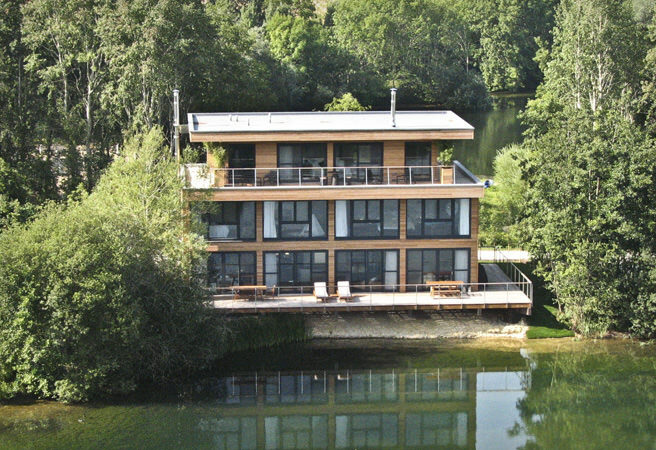 Further details about this property is on our Lakes by YOO – The Lodge page. 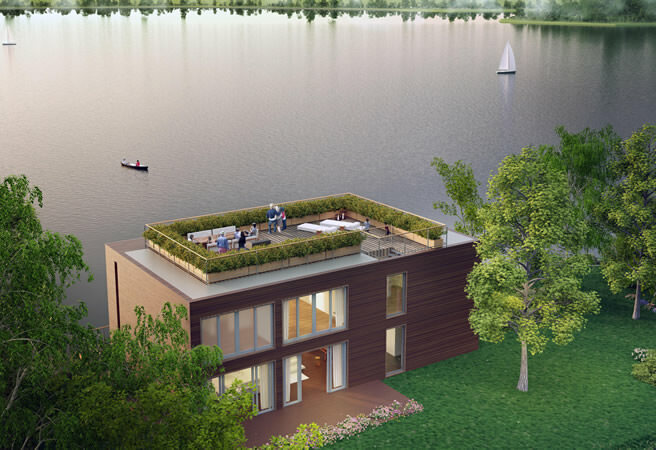 The Lakehouse comes with a wrap-around deck. This affords excellent views of the entire area, particularly the beautiful lake, while allowing residents to track the sun. The simple act of moving to a different view as you enjoy a relaxing afternoon of reading or sunbathing can go a long way in making your Saturday perfect. Further details about this property is on our Lakes by YOO – The Lakehouse page. For those wanting to make the most of good weather and the spectacular views, The Terrace is the clear choice. The Cotswolds can only really be taken in from above the trees, and the Terrace provides a panoramic view of the surroundings from its 100sqft rooftop terrace. The four-bedroom property is typical of a Lakes by YOO home; the layout if spacious, with a kitchen, dining area and living room spaced across over 2700sqft, and every room is positioned to receive maximum daylight. Further details about this property is on our Lakes by YOO – The Terrace page. 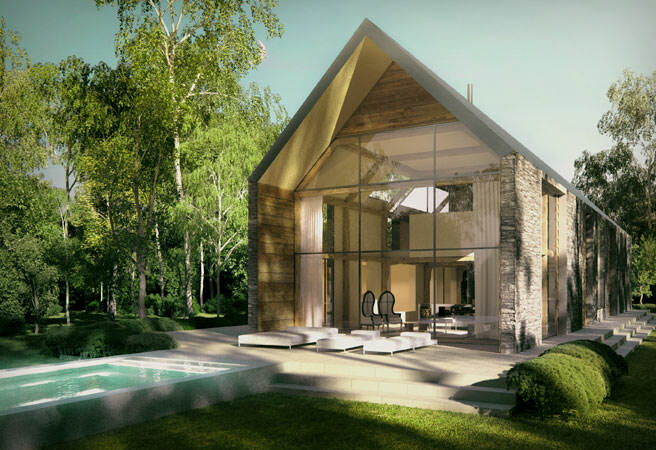 For those wanting a more romantic rustic retreat, Lakes by YOO have designed two types of rural barns, both of which share the other homes’ dedication to minimalist style, comfort and seclusion. The barns use local materials, such as green Oak for timber and Cotswold stone for roof tiles, and are finished in a modern style, including touches of luxury such as outdoor pools. 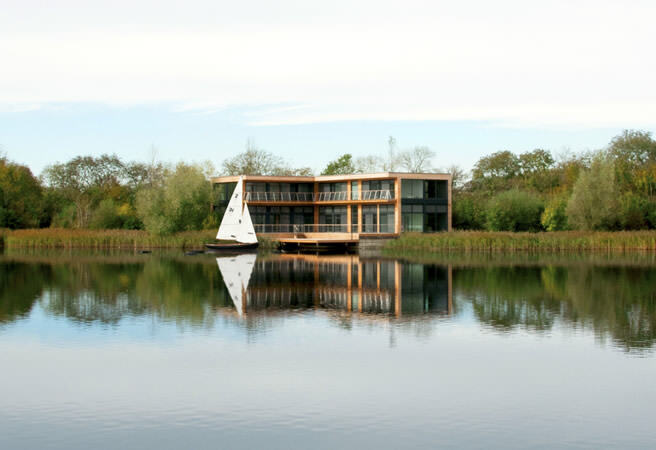 Further details about this property is on our Lakes by YOO – The Barn page. There is a wide range of activities to explore while staying at Lakes by YOO; far too many to go into any detail here. The activities on offer are, as one might expect, typical English country pursuits. However, the wealth of activities to choose from means residents can spend every weekend for many years at the property and never get bored. Examples of the pursuits that residents typically enjoy include fishing, sailing, canoeing, golfing, water skiing, horse riding, gliding, and shooting. All activities can be arranged through the dedicated concierge service. YOO now offer retreats for those who do not have the option of buying a home. 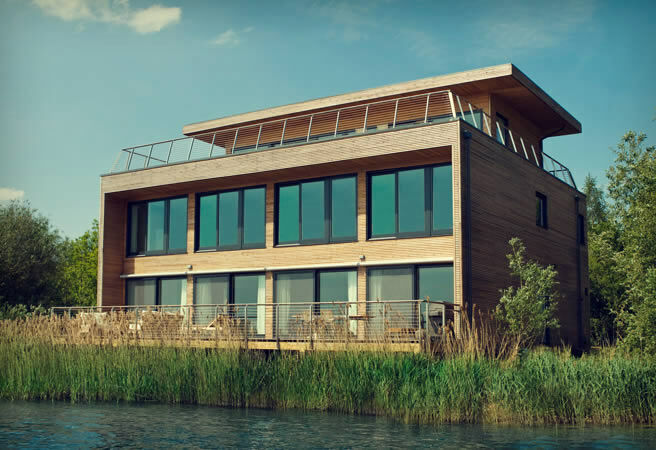 A maximum of eight people can now enjoy a four-day getaway, staying at one of the lakeside homes, with all the benefits afforded to property owners. These retreats can also be coupled with a spa weekend. Guests who choose this option will have an itinerary of yoga, meditation, walking, and other holistic therapies, all under the guide of qualified instructors. This option also includes healthy, detoxifying foods and juices to complement your spa treatment.